The digital edition of Seek, Rockefeller’s award-winning research magazine, is here. A complement to the print edition, the online magazine provides access to all issues of Seek anytime, anywhere. It will also offer online-exclusive features, early access to select stories, and additional content such as video and animations. Initially launched in April 2017, Seek offers a diverse mix of stories about the people, ideas, and conversations that ignite innovation at Rockefeller. In addition to featuring high-impact research findings from our labs, the biannual publication also aims to contribute to larger conversations taking place in the bioscience community, and to offer readers colorful glimpses of discovery in the making. For example, the latest issue includes a deep dive into the most promising developments in HIV research of our time; a conversation with neuroscientist Cori Bargmann about the brain’s intrinsic nature; and the story of how a Mexican family’s immigration to the United States enabled the training of an exceptional young scientist. In addition, you will see unique images captured with brand-new technologies, and a lot more. 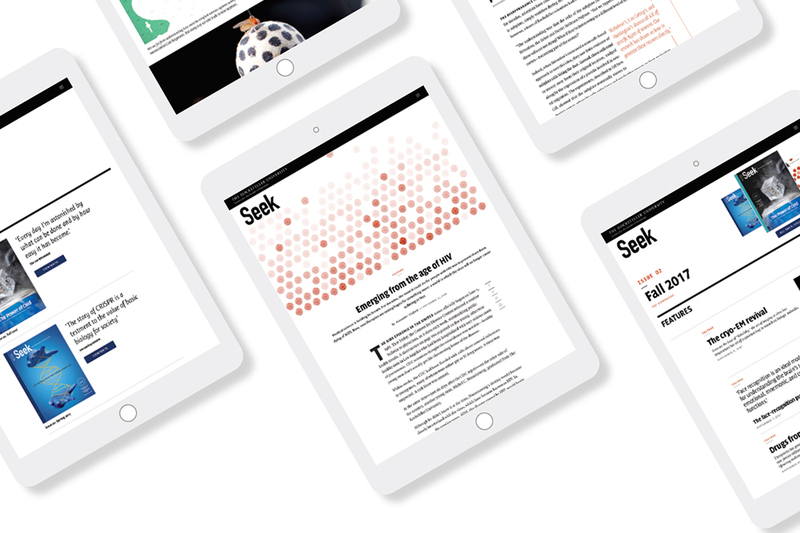 Seek is produced by Rockefeller’s Communications and Public Affairs team with help from Point Five, a graphic design firm, and freelance contributors. If you have questions, ideas, or feedback, please email the editors. Explore the full collection of Rockefeller’s university publications.